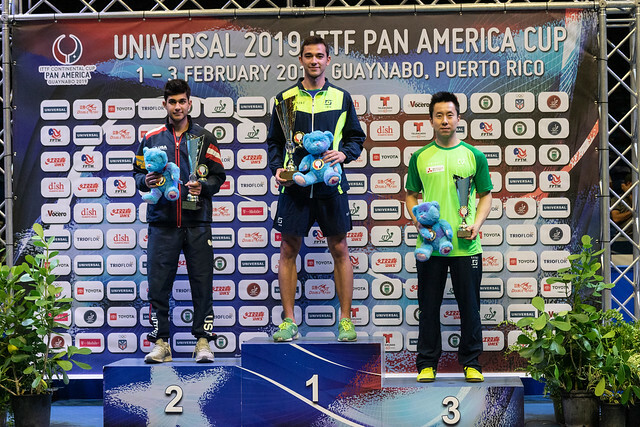 Winner in Santiago in November when she had beaten Canada’s Zhang Mo, to win the women’s singles title at the Pan American 2018 Championships; the host nation’s Adriana Diaz repeated the achievement on the evening of Sunday 3rd February in Guaynabo to emerge successful at the Pan American Cup. In an electric atmosphere, the Coliseo Mario "Quijote" Morale packed to the rafters with adoring fans, Adriana Diaz, the no.2 seed, beat Zhang Mo, the top seed, in five games to arrest the title (13-11, 11-8, 6-11, 11-9, 11-9). Tension, an electric atmosphere, securing the close opening game was crucial in a contest where the level of play rose, from the third games onwards, Zhang Mo increased the tempo; able match the Canadian in the counter top spin department, Adriana Diaz remained focused, sinking to the ground in emotion on winning the final point. It was at that stage pandemonium broke out, wearing all manners of fancy dress, stilt walkers entered the arena to entertain; it was party time in Guaynabo. Significantly, Zhang Mo has played in every final since the tournament was first held in San Jose in 2017; on that occasion, like today, she was the runner up. Last year in Asuncion she was the winner. Meanwhile, earlier in the evening in the contest for third place it had been success for Wu Yue of the United States; the no.3 seed, she accounted for Bruna Takahashi in six games (11-8, 6-11, 9-11, 11-5, 11-6, 12-10) and thus reversed the verdict of last November when she had been beaten by the Brazilian in the women’s team event at the 2018 Pan American Championships in Santiago. Notably it was for both players one position lower than six months ago when the tournament had been held in Asuncion; on that occasion Wu Yue had been the victim of Zhang Mo in the final, Bruna Takahashi had accounted for Mexico’s Yadira Sliva to secure third place.